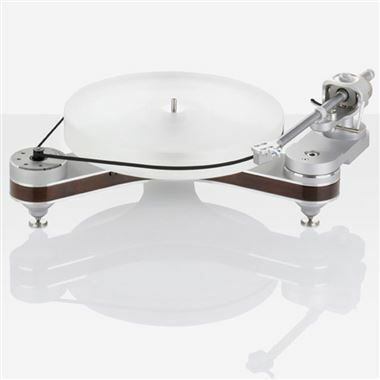 Clearaudio Innovation Basic Turntable with Magnify ToneArm and Concerto V2 MC Cartridge. Available with Online Finance and Free Delivery. The Innovation Basic Wood is based on the technology of the Clearaudio Innovation Wood turntable, but uses a single plinth, smaller plinth as opposed to the stainless steel sub-platter found on the Innovation Wood. Its resonance-optimized chassis shape is based on the proven success of Clearaudio’s three-point design — a combination of Panzerholz, aluminium layers, and aluminium pods. The Innovation Basic Wood uses Clearaudio’s patented CMB (Ceramic Magnetic Bearing) technology, where the platter magnetically levitates on an inverted bearing attached to a low-friction ceramic shaft. The high-torque DC motor is equipped with electronic OSC (Optical Speed Control). The high-density, dynamically balanced 2.75? polyoxymethylene (POM) platter provides excellent dimensional stability. The Innovation Basic Wood is dual tonearm capable. Sharing design and construction features with our Innovation series, the new Innovation Basic Wood turntable features a 38mm-thick, dynamically-balanced POM platter. The optimally designed tri-star chassis minimizes resonance in the audible range while delivering maximum stability. The Ceramic Magnetic Bearing (CMB) and Optical Speed Control (OSC) combine with Clearaudio’s custom high-torque DC motor for excellent speed stability. The Innovation Basic features a second tonearm mount and is available in silver or black aluminum with Natural or Piano Black Lacquer panzerholz wood. Package includes the Magnify ToneArm - Its hybrid bearing on high-precision balls and magnets make the Magnify tonearm something special. This innovative design not only ensures interference-free and resonance optimized playback, it also noticeably simplifies set-up and adjustment. The headshell and azimuth can be easily fine-tuned and with the optional VTA-Lifter it is possible to adjust the VTA even during playback. Concerto V2 Cartridge - Within this satin wood body the technology is outstanding, housing 24-carat gold coils and a patented eight-magnet array unique to our V2 range. Further champion-level ingredients are the boron cantilever and Micro HD stylus. A recipe to win the trophy of sound championship.